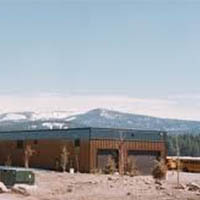 The Tahoe Truckee Unified School District (TTUSD) completed the construction of their Transportation Maintenance Facility (TMO) in Fall 2003. AEC was involved in the survey, civil design, and portions of the permitting for this project. The TMO facility proposed new construction to house the TTUSD Transportation Department Administration Facilities, enclosed parking for 6 to 14 school buses, a vehicle repair facility for the maintenance and repair of school buses and other District vehicles, and a Transportation Department refueling facility. Additionally, on site parking was provided for public parking with 17 standard stalls and two accessible stalls, employee parking with 74 standard stalls and one accessible stall, and outside parking for 40 standard 40' school buses. The AEC survey department provided base mapping for planning, civil design, and the construction staking for this project, as well as legal descriptions and exhibits to accommodate the lease of the land to TTUSD. This required research of title reports, deeds, existing easements, and assessor's maps. 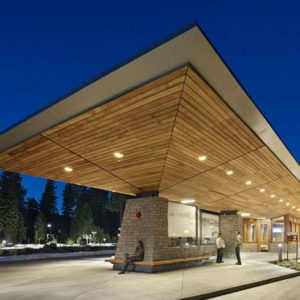 This Lake Tahoe Environmental Improvement Project on U.S. Forest Service Land involved construction of a 6-bus inter-modal transit facility, 131-space parking lot, relocation of 450 feet of recreation access road, relocation and extension of 1,600 LF of multi-purpose recreational trails, and all storm drainage and water quality treatment systems. Roadway and drainage improvements to State Route 89 were required for left turn channelization and highway intersection improvements for the relocated recreation access road. The project design incorporated low-impact design principles, extensive use of permeable pavements and advanced stormwater management systems. 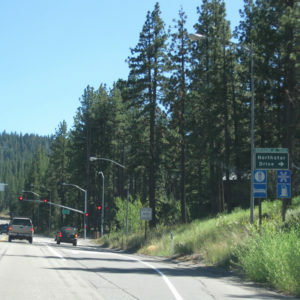 AEC provided surveying services for the Highway 267 Northstar Right Turn Lane for Northstar-at-Tahoe constructed in the Fall 2000. The project required the surveying, permitting, and civil design of a right turn lane from State Highway 267 onto Northstar Drive. AEC provided coordination with Placer County and Caltrans in the preparation of plans for work within both agencies' right-of-way. AEC staff completed project surveys, a legal description and plat for an offer of dedication to Caltrans, civil design and final as-built plans.